The Knights Hospitaller, also known as the Knights of St. John, were established following the first Crusade to protect and treat Christian pilgrims to the Holy Land. They are recognisable by their black surcoat with a white cross. 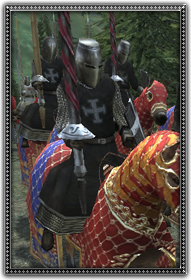 An elite and powerful fighting order of well trained knights wearing heavy mail or plate armour and armed with a lance.